My Weddings in Film series explores the different stages of getting married as seen through classic movies. 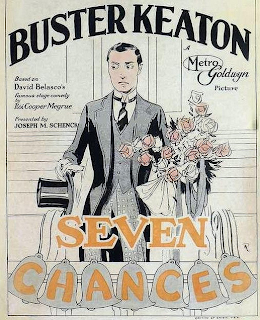 The first film, Seven Chances (1925), starts at the very beginning; meeting the right person. The most difficult part of the path to the altar is finding that special someone to whom you want to marry. Some people like to refer to that person as their “soulmate”. I like to describe him or her as that one human being on the planet who is willing to put up with you for life. For those of us who are (very) lucky, we just happen to stumble upon that person. It can be love at first sight, love at tenth sight or love after a few months of pretending you hate the person and then giving in to those feelings you have been suppressing all that time. For the rest of us, it’s like searching for a needle in a haystack. The more time you spend searching, the better your chance that you’ll actually find the “One”. For Buster Keaton’s character Jimmie Shannon in Seven Chances (1925) he’s already found his soulmate in his girl Mary Jones played by Ruth Dwyer . What’s unusual about Jimmie is that his dating history has been sped up by circumstances beyond his control. By dating history, I mean that period of time between developing an interest in romantic partnership, the search for that special someone and the mutual agreement to a long-term relationship. In normal circumstances, he would have continued his very slow, shy pursuit of Mary Jones. We see just how slow it is in those first few scenes of the film. Jimmie gifts Mary a Dalmatian puppy and a few more scenes later we see that the puppy is now a full-grown dog and seasons have past but Jimmie has not been able to take things to the next level with Mary. He’s stuck in the "friend zone" because up until this point he hasn’t been able to tell her he loves her. Jimmie’s business is in serious trouble. His bad luck seems to change when his grandfather passes away and leaves him a tidy fortune of $7 million. However, he can't just deposit the money in the bank and call it a day. His grandfathers will stipulates that Jimmie must marry by 7 o’clock on his 27th birthday. Or he doesn't get a dime. No problem, right? The tricky part is that he finds out about the will on the exact day of the deadline. His plan is simple. Ask Mary to marry him, inherit his grandfather's fortune and live happily ever after. But sometimes life gets in the way of even the best laid plans. The absurdity of the story lies in the fact that love is being put on a schedule. It's like the famous song says "you can't hurry love, no you'll just have to wait." Love takes it's own sweet time. And marriage is an arrangement that has to be mutually agreed upon. There is a terrible moment of miscommunication between Jimmie and Mary. Jimmie only wants Mary, Mary thinks his motivations are purely for money but figures out later that his intentions are genuine. While Mary searches for Jimmie, his business partner convinces Jimmie that he must marry immediately. So Jimmie does the worst possible thing. He looks for a new bride. He gets more than he bargains for and all sorts of hilarity ensues. 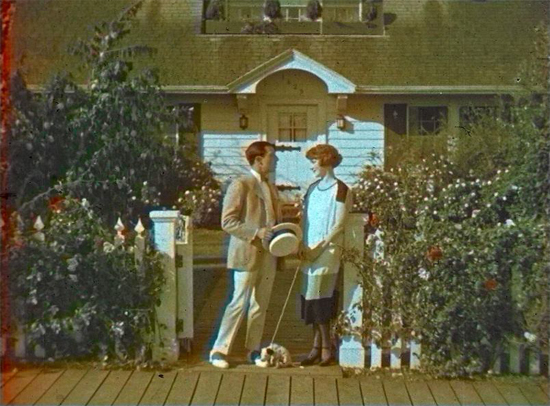 There are a few lessons about love that can be extracted from Buster Keaton’s comedy. 1) Love can never be rushed 2) Communication is key 3) Money always complicates relationships and 4) if you advertise for a bride in your local newspaper, make sure to bring your running shoes (just joking!). Folks who are single and still searching for their special someone may take comfort in the ridiculousness of dating/proposing as depicted in the movie. Viewers in committed relationships will watch and be glad they don’t have to go through that again! However, everyone, no matter their age or relationship status, will laugh heartily at Buster Keaton’s special brand of comedy. 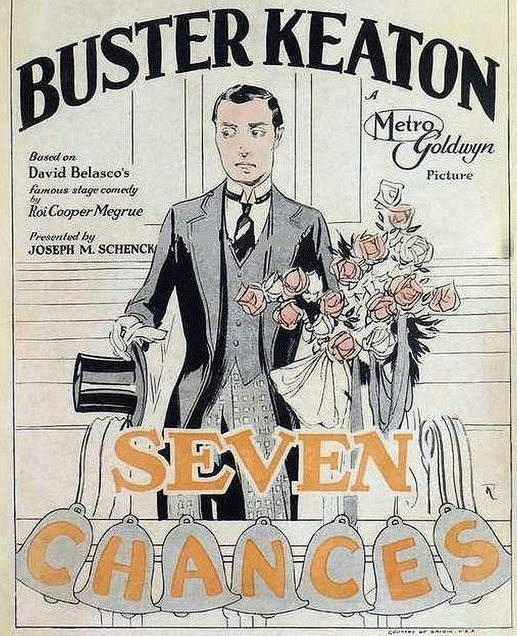 Make sure you check out my post about my experience watching Seven Chances (1925) on the big screen with live musical accompaniment.